Instrument Assisted Soft Tissue Mobilisation or Simply IASTM is a new range of tool which enables clinicians to efficiently locate and treat individuals diagnosed with soft tissue dysfunction. The technique itself is said to be a modern evolution from Traditional Chinese Medicine called Gua Sha.However Gua Sha was not used to treat Musculoskeletal conditions but was traditionally applied along meridiens to move the bad chi out through the skin.IASTM is a is a procedure that is rapidly growing in popularity due to its effectiveness and efficiency while remaining non-invasive,with its own indications and limitations. tissue, increased vascular response, and the remodeling of unorganized collagen fiber matrix following IASTM application. Fibroblast is considered the most important cell in the extracellular matrix (ECM). The repair, regeneration and maintenance of soft tissue take place in the ECM. The fibroblast synthesizes the ECM, which includes collagen, elastin and proteoglycans, among many other essential substances. Fibroblasts have the ability to react as mechanotranducers, which means they are able to detect biophysical strain (deformation) such as compression, torque, shear and fluid flow, and create a mechanochemical response. Gehlsen et al investigated the effects of 3 separate IASTM pressures on rat Achilles tendons. They concluded that fibroblast production is directly proportional to the magnitude of IASTM pressure used by the clinician.Davidson et al supported Gehlsen et al. by concluding that IM significantly increased fibroblast production in rat achilles tendons by using electron microscopy to analyze tissue samples following IM application. Davidson et al. found morphologic changes in the rough endoplasmic reticulum following IM application.Thus, indicating micro trauma to damaged tissues, resulting in an acute fibroblast respons. Studies have also showed clinical benefits of IASTM showing improvements in range of motion,strength and pain perception following treatment. Melham et al found that IASTM significantly improved range of motion in a college football player following 7 weeks of IASTM and physical therapy. Melham et al. found that scar tissue surrounding the lateral malleolus was reduced and remodeled structurally following IASTM application. Wilson et al found improvement in pain reduction and impairment scale at 6 & 12 weeks following IASTM application for patellar tendonitis. IASTM provide clinicians with a mechanical advantage, thus preventing over-use to the hands.Snodgrass SJ surveyed physical therapists and found that after spinal pain, the second most common cause for absenteeism from work was overuse of the thumb. Ninety-one percent of physiotherapists using some sort of massage had to modify their treatment techniques because of thumb pain. There are different varieties of tools and companies with different treatment approaches and instrument design (material, shape etc) to perform IASTM, such as Graston®, Técnica Gavilán®, Hawk Grips®, Functional and Kinetic Treatment and Rehab (FAKTR)®, Adhesion Breakers® and Fascial Abrasion TechniqueTM. 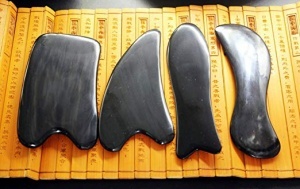 Buffalo Horn-These tools are used by chinese Gua Sha practitioner but can be used for IASTM too.However it does not resonate well. Quite cheap to obtain. Jade Tools - Much heavier and more slippery than the above tool.Can break easily if dropped. Plastic tools- New in the market.Lots of design suited for Manual Therapy work.Largely used for training before upgrading to the next class of tools. Stainless Steel Tools- Best tools for IASTM.A must have tool for Physiotherapist .The tissue resonates well when the steel runs on it.Comes in different sizes for different parts of the body depending on the company producing it. ↑ Gua Sha.https://en.wikipedia.org/wiki/Gua_sha. (accessed 06 July 2018). ↑ Fowler S, Wilson JK, Sevier TL.Innovative approach for the treatment of cumulative trauma disorders.Work 2000;15:9-14. ↑ Julie K. Wilson, Thomas. Sevier, Robert Helfst,Eric W. Honing, and Aly Thomann. Comparison of Rehabilitation Methods in the Treatment of Patellar Tendinitis. J. Sport Rehabil. 2000;304-314. ↑ Thomas L. Sevier, M.D. Gale M. Gehlsen, Ph.D. Sue A. Stover, P.T. Julie K.Wilson M.S.A. Form of Augmented Soft Tissue Mobilization In the Treatment of Lateral Epicondylitis.Medicine and science in sports and exercise.1995;27(5). ↑ Gehlsen GM, Ganion LR, Helfst R.Fibroblast responses to variation in soft tissue mobilization pressure.Medicine science sports exercise.1999; 31(4):531-535. ↑ 6.0 6.1 Davidson CJ, Ganion LR, Gehlsen GM, Verhoestra B, Roepke JE, Sevier TL.Rat tendon morphologic and functional changes resulting from soft tissue mobilisation.Medicine and science sport exercise.1997 Mar;29(3):313-9. ↑ Melham TJ, Sevier TL, Malnofski MJ, Wilson JK, Helfst RH Jr.Chronic ankle pain and fibrosis successfully treated with a new noninvasive augmented soft tissue mobilization technique (ASTM): a case report.Med Sci Sports Exerc.1998 Jun;30(6):801-804. ↑ Julie K. Wilson, Thomas. Sevier, Robert Helfst, Eric W. Honing, and Aly Thomann. Comparison of rehabilitation methods in the treatment of patellar tendinitis. Journal of sports rehabilitation.2000 Nov; 9(4)304-314. ↑ Suzanne J. Snodgrass, Darren A. Rivett. Thumb Pain in Physiotherapists: Potential Risk Factors and Proposed Prevention Strategies. Journal of Manual and Manipulative Therapy. 2013 Jul;10(4):206-217.